Gorgeous 5-acre VIEW lot in development with community garden and orchard, bold creek with 2 waterfalls, hiking trails and natural beauty. Private! Beautiful piece of property. Owner has the option of purchasing for $300/Yr. the amentites from Powderhorn which include tennis, swimming pool, 2 ponds, gorgeous picnic area on the bold, rocky creek, and clubhouse with ping pong, pool, kitchen and dance floor. This gives this property the most incredible amenites in addition to what Brightwood naturally has to offer. Rare opportunity! Waterfall's not on this lot but part of the amenities of B'Wood Awesome lot! Listen to the waterfall as you fall asleep at night! 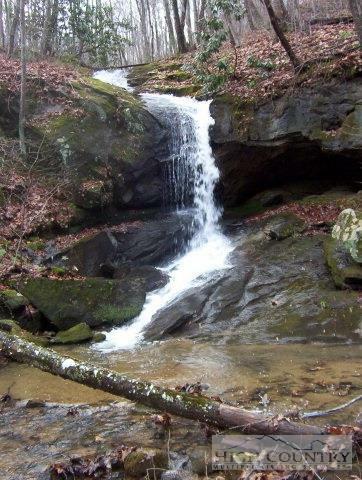 The building site is by this waterfall...Holly Falls...which is part of the common area of Brightwood. It's not actually on this lot but right next to it. Seller has put in road to house site,just needs gravel. See VIRTUAL TOUR for all of the incredible amenities of this development and Powderhorn next door. Wonderful private lot near waterfall. Listen to the waterfall as you fall asleep! Picture is not taken from this lot. Listing provided courtesy of Margo Lenmark of Blowing Rock Investment Properties.